Herb Kohl is also an incredible supporter of the leaders in our schools. He recognizes the importance of having Great Leaders to have Great Schools. In an effort to celebrate these individuals, his foundation also wants to recognize a select group of individuals with your help. If there is a principal or administrator that you believe is deserving of this honor, take a moment and fill out the nomination form for that individual (see link below). Cardinal Pride Is Alive!! Celebrate! PURPOSE The purpose of the Herb Kohl Outstanding Wisconsin Leadership Award is to recognize and support excellence in Wisconsin school administration. The Herb Kohl Educational Foundation's goal is to support Wisconsin principals in pursuit of their unrealized goals for their schools or professional development. 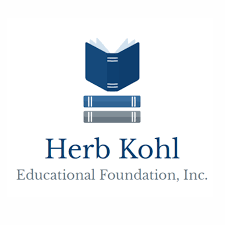 The 12 public school Kohl Leadership Award recipients and the schools those principals lead will each receive $6,000 grants from the Herb Kohl Educational Foundation and will be recognized at a spring banquet. The Association of Wisconsin School Administrators will choose the Elementary and Secondary Principal of the Year from among the public school recipients of the Herb Kohl Leadership Award.